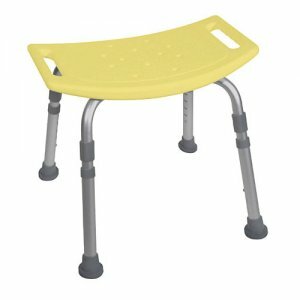 Bath and Shower Bench / Chair without Back - Aluminum Deluxe - Yellow. With a lightweight aluminum frame and angled legs with suction style tips, this deluxe bath bench from Drive Medical combines strength, comfort and added security. The blow molded bench features drainage holes that help reduce slipping. The aluminum frame is not only light, it durable and corrosion proof. The seat and legs snap together easily, while suction-style tips secure the bench in place. The product comes with a limited lifetime warranty. 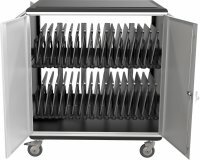 Outside Legs (Width): 17"; Outside Legs (Depth): 17"; Seat (Width): 20"; Seat (Depth): 14.5"; Seat (Height): 15.75"-19.75"; Product Weight: 6.5 lbs.